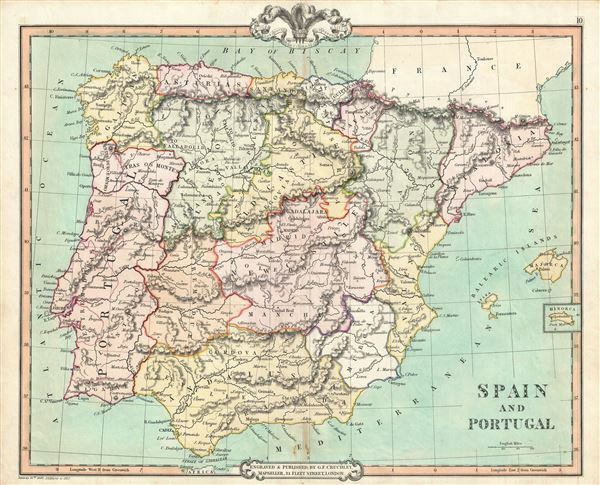 This is a beautiful example of George Frederick Cruchley's 1850 map of Spain and Portugal. It covers all of Spain and Portugal from the Pyrenees to the Strait of Gibraltar and includes the Balearic Islands of Ibiza and Majorca, with Minorca in a small inset. The map is color coded according to regions and territories and notes several cities, towns, rivers, mountains and other topographical features. As this map was printed liberal sentiments within Spain were gaining popularity. This eventually led to the Progressive Biennium, in which the Progressive Party tried to replace the conservative liberalism of the Moderate Party with more radical liberalism.